Shepperton hotels include the Warren Lodge Hotel which is located in a tranquil riverside location. This Shepperton hotel offers a scenic Thames setting close to Hampton Court and London with all it's major tourist attractions. 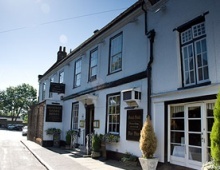 This hotel offers some of the finest Shepperton accommodation with good sized, recently refurbished bedrooms with en-suite bathrooms, Wi Fi, colour TV, hair dryer and tea & coffee making facilities. A lot of the bedrooms also have gorgeous river views. The Warren Lodge Hotel provides facilities for private dining and parties with a banqueting menu and can seat up to 130 guests for a buffet style party. The Warren Lodge Hotel is an ideal wedding venue in Shepperton with a garden room, conservatory and coach house which can be used depending on the wedding party size. The beautiful riverside terrace can be accessed from the garden room & conservatory, ideal for wedding photos on a lovely day. The Warren Lodge Hotel also has a meeting room for up to 70 people with wireless internet access, LCD & overhead projectors. Being close to Gatwick & Heathrow airport & the M25, it's ideal for meetings, seminars, training and conferences. Food and drink packages are available.